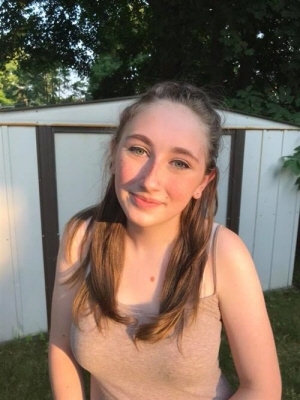 Theresa Ruth Joens, age 16, died unexpectedly on Sunday March 31, 2019. Born in Beverly, she was the daughter of Deacon Michael and Elizabeth (Sims) Joens. She proudly attended the Essex Technical High School, where she was a sophomore student in the Automotive Technology department. Blessed with artistic and technical talents since she was very young, Theresa was passionate about painting, drawing, music, and cars. A wonderful friend, daughter and little sister, she will be remembered by all for her fierce spirit, her humor, her tenacity, and her heart. Surviving her, in addition to her parents, are her two sisters, Anna Lisa Joens and Mary Agnes Joens, maternal grandmother Agnes Sims of NJ, paternal grandmother Dietlinde Joens of Germany, and several aunts, uncles and cousins, as well as numerous loving friends. She was predeceased by her grandfathers, William Sims and Robert Joens. To send flowers or a remembrance gift to the family of Theresa Ruth Joens, please visit our Tribute Store. "Email Address" would like to share the life celebration of Theresa Ruth Joens. Click on the "link" to go to share a favorite memory or leave a condolence message for the family.